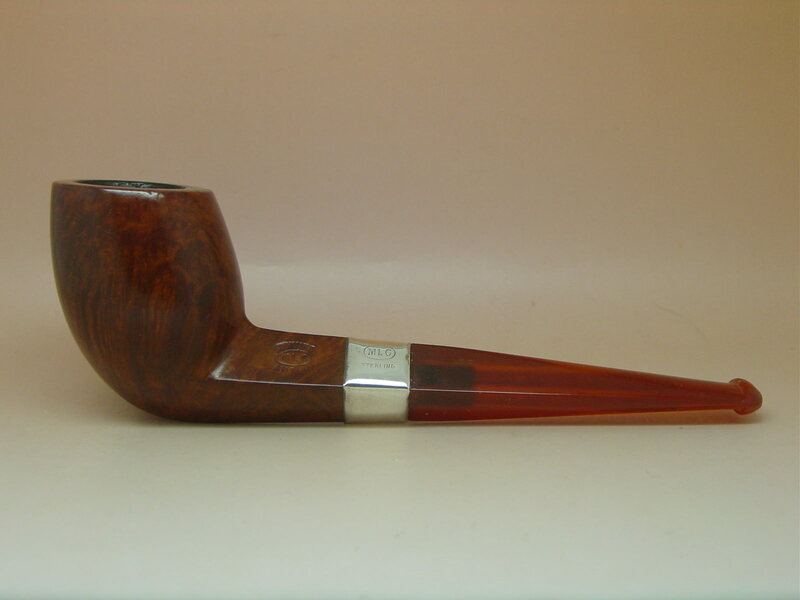 This is a cased MLC brand tulip shaped straight billiard pipe with a diamond shank. 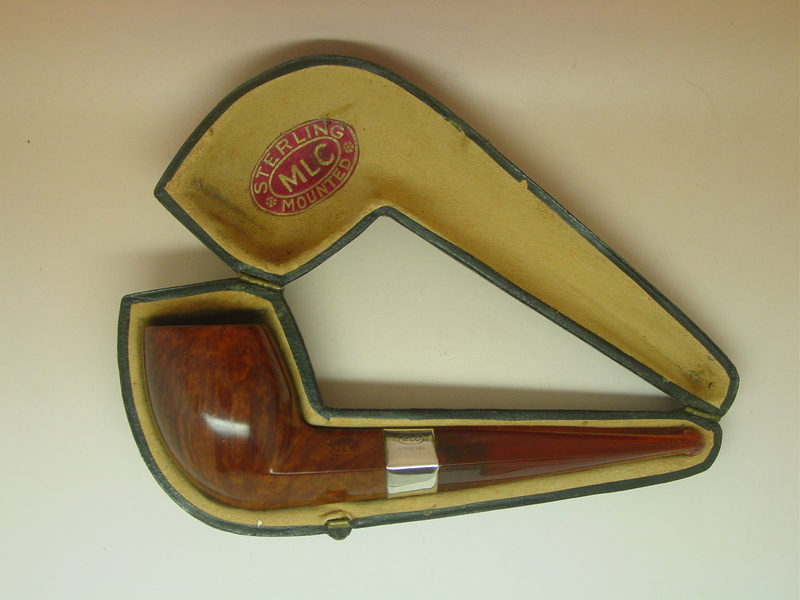 The MLC or Mary Linkman Company was a popular pipe manufacturer from the late 19th century to the mid 20th century. Early on they made high quality meerschaum and briar pipes. Based on materials and style, my guess is that this pipe dates to the period 1900-1910. The bowl is good quality briar with interesting grain. I don’t see any fills. The shape is unusual for today but was not uncommon for the era. That is, the canted tulip billiard with the diamond shank. The front has the initials FP carved into it. The carving was obviously done by someone with great skill. The depth is even and the letters are carved in a classy font. There are a few small shallow marks to the left of the letters. Looking at the way the bowl fits in the case, it’s possible that the rim was reshaped. But judging by the wear and patina on the rim, if it was reshaped, it was done a long time ago. Judge that for yourself. The bowl is in otherwise very good condition for its age. The left shank is stamped with the MLC logo and the words Genuine Amber over and under it. I think the band is silver plate. It also sports the MLC logo with the addition of the word Sterling. The carbonized chamber is straight and true showing no defects at all. It has a thin layer of cake. Though the shank is stamped Genuine Amber, I think it is more likely a material referred to as amberoid. As is common for this material it shows some small internal fissures. There is also a chip at the button orifice and there are some very small chips at the shank end. It also shows some light tooth wear, top and bottom, at the button. The tenon is a bone screw type that is darkened from use. The screw alignment is good. The airway is very open and this is a good smoking pipe. The case is in very good condition. The smooth leather shows wear at the contact points primarily on one side. It was probably rolling around in a drawer for many years. There is no flaking or loss anywhere on the case. The hinges and clasp work well. The tan interior felt is a little dirty but is in very good condition. The logo reads: MLC Sterling Mounted. 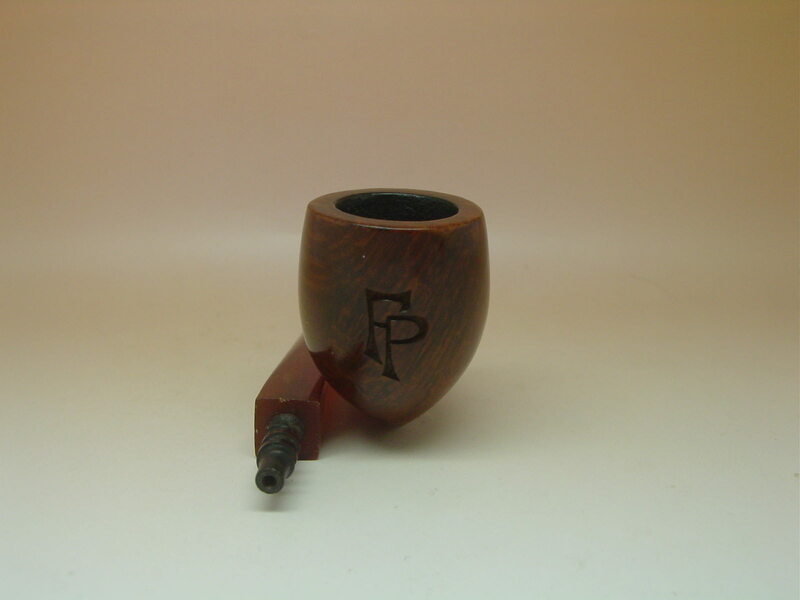 This pipe is a fairly rare one. Not just because of the shape. There aren’t that many of the older MLC pipes in good shape with cases around. 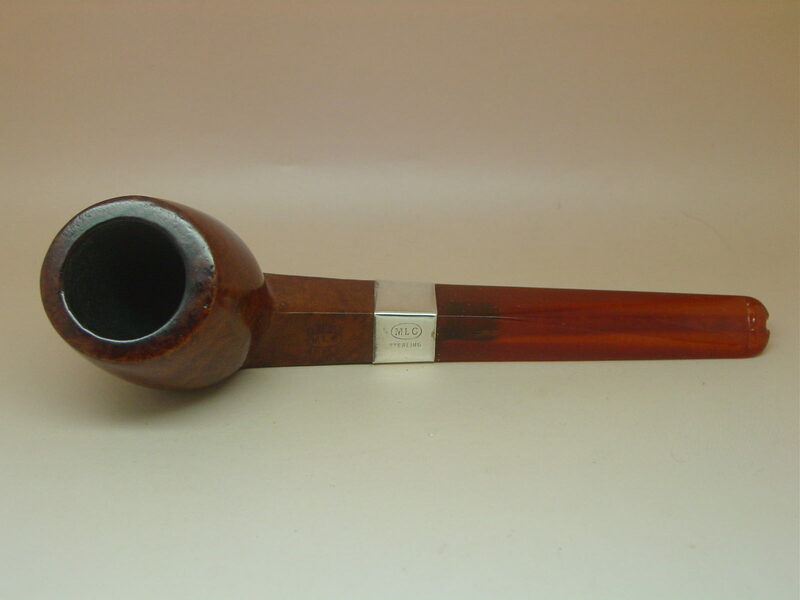 The pipe measures: 5.5” from the bit to the bowl leading edge x 1.75" with just over a .75" bore at the rim. It is clean and ready to smoke. Send it back for a refund if you are not satisfied. $110 shipped. That is one beautiful pipe. Just love those amber/amberoid stems. You know, it never occurred to me that MLC had done the initials. But why not? It may have been a neat special order detail for an extra dollar. I always thought the tobacconist or a jeweler had done it. Or it could have been any of the three! I've had the pipe for awhile. I always considered the initials part of the pipe's history.